Posture and anatomy are crucial factors in avoiding knee, back or hip pain and it all starts from the ground up. Your foot is a complex structure of 26 bones and 33 joints, layered with an intertwining web of more than 120 muscles, ligaments, and nerves. Your feet are extremely important for the entire body, as they are the ones controlling your balance and posture. In fact, balance is directly affected by the amount of pressure we put on the feet, so any pain in leads to an imbalanced walking/standing. 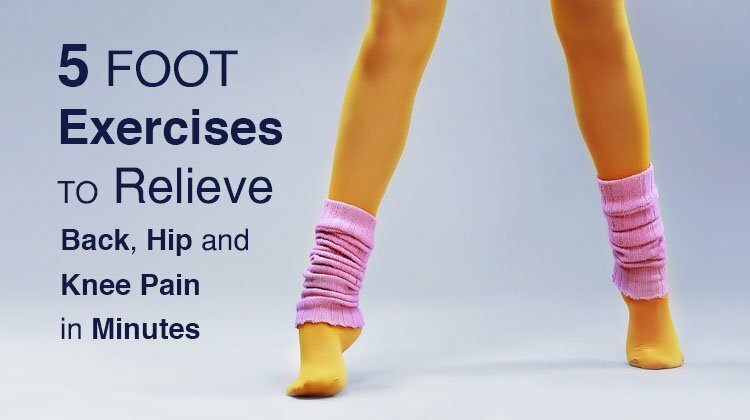 On the other hand, a few exercises during the week will boost the blood flow and strengthen the muscles in your feet, ensuring optimal alignment of muscles and bones in the body. By taking proper care of them, your feet can prevent back, knee and hip pain. Take further note that most foot pain is caused by shoes that do not fit properly or that force the feet into unnatural shapes, such as pointed-toe, high-heeled shoes. Furthermore, unsuitable shoes can even be the cause that aggravates your sciatica. The 5 exercises outlined below (with the videos) will strengthen your feet, help prevent pain, and improve your balance. A stronger and more flexible feet and ankles will ensure a long term, pain-free service. Heel raises are great for realigning the tendons in your calves and readjusting your ankle joints. They will also help strengthen your toes and improve your balancing. Perform about 2-3 sets for best result. Repeat the movements 5 more times. For best results, do about 5 sets with each foot. Do about 3 sets for each foot to help heal knee pain. These stretches can feel a little frustrating at first, but they really help build up muscle strength and dexterity in your feet. They’re particularly great for runners! Release and repeat 5 times for each foot. There you have it folks, a few exercises and you should be pain-free in no time! These exercises can take some 20 minutes to complete. Preform them in succession of each other 2-3 times per week for best results. If you’re also experiencing back pain, you can also try this exercise.